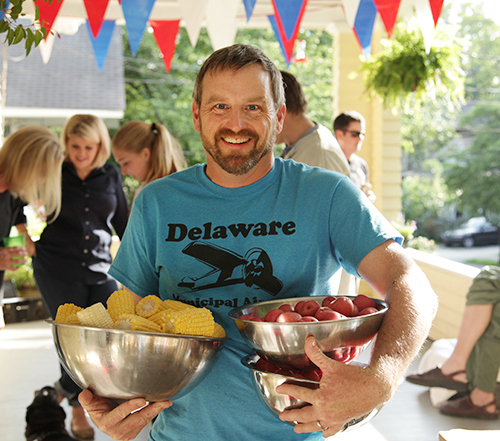 I love a good southern party, specifically a Low Country Boil on a nearby front porch. My uber talented friend, nearby neighbor and colleague, Monica Martino drew this lovely illustration and hosted this shindig last month- along with her husband, Chris. It was a no brainer to add this to the calendar. Yes, please! 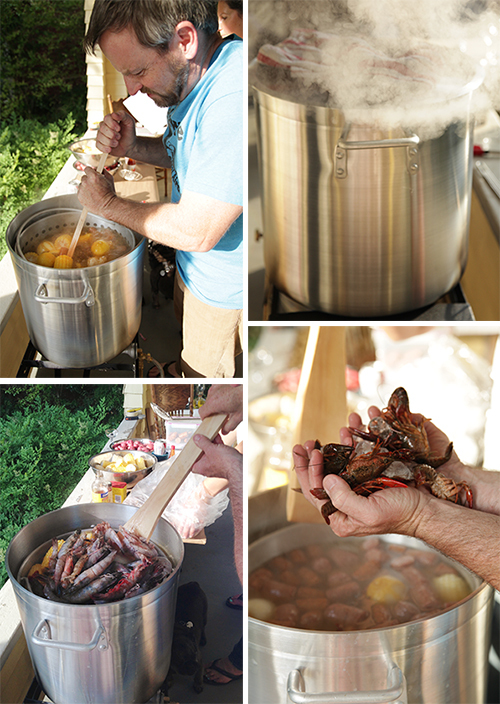 Now any good Low Country Boil includes crawfish. The trick is you gotta keep 'em alive until right before you boil them. It's a process for sure. As Monica shared, "I'd eaten my share of crays while working on a tv show about shrimpers in Louisiana, but this was my first time buying and cooking them. We bought our crawfish in the morning from the Crawfish Shack and kept them cool until it was time to cook." 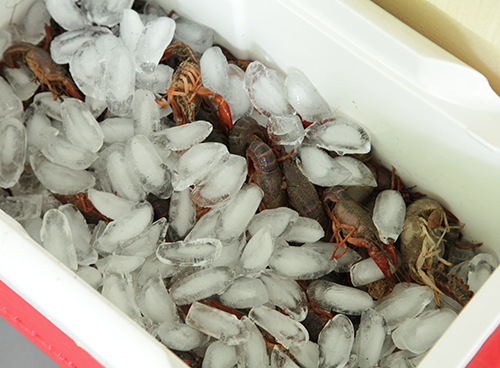 Monica, "While the water was boiling, we 'purged' the crawfish in the cooler with running cool water and rock salt. This makes them release all their impurities. We rinsed them until the water ran clean, then they were ready to cook." They bought a 40 quart pot with a steamer basket and a big wooden paddle to mix. Besides the crawfish, the boil included spicy andouille sausage, sweet corn, red potatoes and shrimp- plus a lot of seasoning, lemons, garlic and a bay leaf or two. And seasoning is paramount in any Low Country Boil. 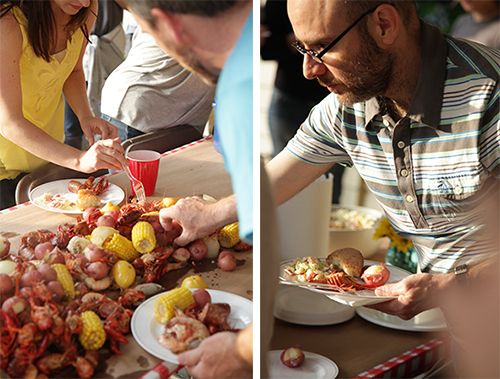 Zatarain's concentrated Shrimp and Crab Boil has been a New Orleans staple since 1889. It adds a lot of spice. As Monica wisely shared, "Don't be afraid to go a little spicy- that's why there is cold beer available." It was fun watching these two work their magic so seamlessly. Monica, "Everything must be fresh and the order you add to the pot is important. Start with the seasonings, onions, garlic, lemons, pepper and sausage. Then add corn and potatoes. Then comes the shellfish. Other than that, you really can't screw it up!" This has to be the very best part. I'm getting hungry just looking at this whole scene again as everything was so ridiculously tasty. 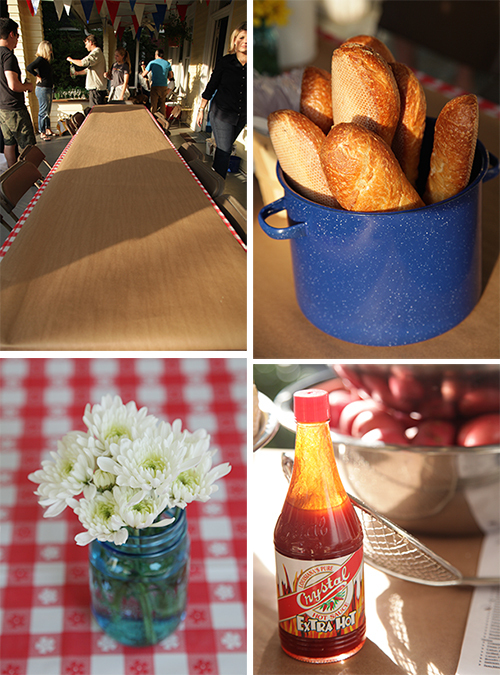 Monica, "It's such a dramatic way to serve up the food and it's so fun to eat straight off the table. It's also a great way to get to know people because there's nothing like sharing a meal with strangers to turn them into friends." Chris and Monica hope this becomes a tradition every year. Um, yeah...it better be.